Natasha Kraemer is a graduate of the Royal Academy of Music, London. A pupil of Jenny Ward Clarke, she specialised in historical performance on Baroque and Classical cello. Natasha performs across the UK, Europe and Australia with many orchestras and chamber groups. These include Orchestra of the Age of Enlightenment, The English Concert, The Gabrieli Players, and The Sixteen. Since moving to Australia in 2016, Natasha is delighted to be a part of the HIP movement, working with groups such as Van Diemen’s Band, Genesis Baroque and the Australian Haydn Ensemble. 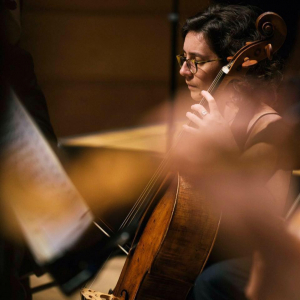 She is also co principal cellist with the Australian Romantic and Classical Orchestra, and has enjoyed extensive tours across the country with these and other ensembles. In 2016 she performed the complete Beethoven Symphonies at the Sydney Festival with Anima Eterna Brugge, under the baton of Jos van Immerseel. She has played in various concerts at the Peninsular Summer Festival, including chamber performances of Beethoven’s Scottish Songs with Sophie Daneman, Rachael Beesley and Erin Helyard. Natasha’s passions extends beyond early music. Give her an excuse to jazz things up, she’ll pizz a bass line or tap her cello as a drum. When not performing, Natasha can be found behind a camera lens, or face to face with an espresso machine pursuing a fine cup of coffee!